How many children can I monitor from one BulliPatrol account? BulliPatrol does not have a cap on the number of children that can be monitored. Every child in your family is covered with one BulliPatrol account. Which social media accounts can be monitored by BulliPatrol? BulliPatrol currently monitors Facebook, Instagram, Twitter and Android Messaging. Your account will receive automatic updates as we continue to add new platforms. Does BulliPatrol monitor every message? BulliPatrol captures and analyzes every message sent to and from a connected account, however, we only show those messages that the child receives on the dashboard. As parents, we believe in the importance of giving our growing children the right tools to keep them safe online, while teaching them responsible, safe, online behavior. Allowing them the privacy to put these lessons into practice is of utmost importance. How does BulliPatrol protect my child’s privacy? While we do monitor every message sent to and from a connected account, only the incoming messages are scored for positive and negative content and shared with the account’s subscriber. Is my child’s data secure? Yes, BulliPatrol maintains the highest data security and protection standards. Will BulliPatrol alert me if my child is bullying other children? To protect your child’s privacy and ensure that they trust the platform, BulliPatrol does not disclose your child’s communications. Although BulliPatrol is not a counseling service, we do provide information including hotlines and counseling centers for those experiencing cyberbullying or any other related issues. We also recommend that you check out BulliPatrol’s blog for additional information regarding online safety, cyberbullying, and conversations with your teens. As parents, we never intended for BulliPatrol to replace the important role of parents. It’s only meant to support you in your efforts to raise healthy, happy kids. Parents are busier than they have ever been and with kids sending/receiving over 3,300 messages a month, you can’t possibly keep up without the help of a monitoring tool like BulliPatrol. 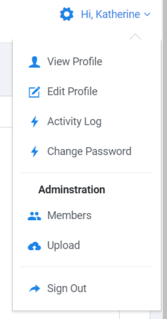 Your user name and password can be changed in your user profile. If you have forgotten your password, you can request help on the log in page. How do I add my child’s social media accounts? After you sign up for BulliPatrol, you will see the following screen below. You’ll want to enter your child’s first name and either an email address or mobile phone number. From here, your child will receive the request below from BulliPatrol to add their social media accounts. If you have more than one child, you will need to complete this form for each child. Your child then clicks on each application button and follows the instructions to connect their accounts. How do I update my child’s account information if they change their password? Sign on to your dashboard and go to the child’s activity snapshot area. On the bottom left corner of the area, you’ll see an option to Resend Connection Request. Click on that link and a request will immediately be sent to your child. What if my child changes their password or username on their social media account and I don’t know it? Parents will start to see a reduction in activity on that specific account. BulliPatrol is working to add functionality to automatically alert you when an account is disconnected. 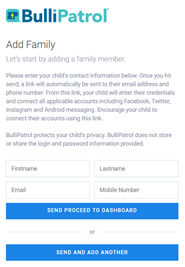 I know my child’s log in information, can I add their accounts directly to BulliPatrol? It’s not unusual for teens to have private social media accounts that you may not know about. Our process for adding a social media account allows your child to enter their own credentials directly through the sign up link. This process is a good way to let them know that you care about their safety while respecting their privacy. How do I use the BulliPatrol Dashboard? Simply sign into your BulliPatrol account to view your dashboard. You’ll be able to view the account information for all of your children in one place. Once you enter your user name and password and click on the sign in button, you will be taken to the Dashboard. Can I have alerts sent to multiple email addresses? Currently, alerts can only be sent to the registered account email address. BulliPatrol is working to expand this functionality. Can multiple parents monitor the same children from one account? Absolutely! In fact, we encourage a team approach to monitoring your child’s social media activity. 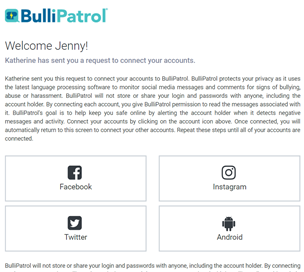 Once your BulliPatrol account is set up, simply share your credentials with your spouse or partner. If there are special circumstances, please contact us at support@bullipatrol.com and we’ll be happy to add a second user at no extra charge. I’ve received an alert about negative activity. What should I do now? To seek extra help for your child, our Resources page has readily available advice and information. If you have any further questions please email us at support@bullipatrol.com. We will respond to your email within 24 hours. We are always happy to help! I signed up for BulliPatrol through my current employer; if I change companies can I keep using BulliPatrol? We definitely don’t want you to lose access to your BulliPatrol account, just because you’ve changed jobs. Your child’s safety is too important! Simply Contact Us and let us know so we can make other arrangements for you. What is BulliPatrol’s cancellation policy? You may cancel your subscription at any time and there is no cancellation fee, however you are obligated to pay for your current billing cycle. You may cancel your subscription through the My Account page on your BulliPatrol dashboard, under View Profile. I need additional support with my BulliPatrol account. Who can I contact? Please direct any questions or concerns to support@bullipatrol.com. We will respond to your email within 24 hours.